In 1949 it was thought London would never see herons, or several other bird species again. How things change. 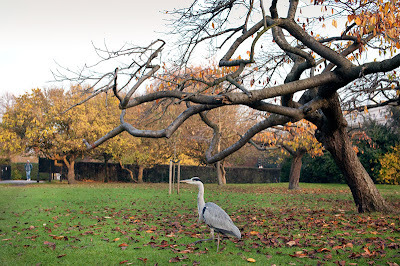 In 1968 the first pair of herons made their nest in Regent's Park. By 1970 this had increased to 10. The efforts of those who work to keep the parks green and the waterways clean plus keeping areas for the birds and wildlife free from us humans has seen the population of herons increase to its current 27 pairs. This one was very wary of me while at the same time wanting to know if there might be a tasty morsel in my bag. A camera was not appreciated. How nice to see these birds in the parks. I'm glad you were able to capture a photo of this one to shar with us. Wow I hope care is taken with the herons, 27 pairs does not seem like very many. Have been catching up with posts I've missed while away Mo, great 'Balmy Autumn' shot, horrified at the statistics for young children recruited for fighting purposes, someone has to do something about that situation. Loooved 'Under the spotlight' such a fab image and I'd say a trio of confident young men out on the town!! I saw one at the local public gardens pond earlier this year. Later I found all the fish had gone! Herons are such beautiful brids, how wonderufl that the city of London is so committed to keeping them safe!